Explaining gaps in employment can be intimidating, but there are a couple effective methods you can use. 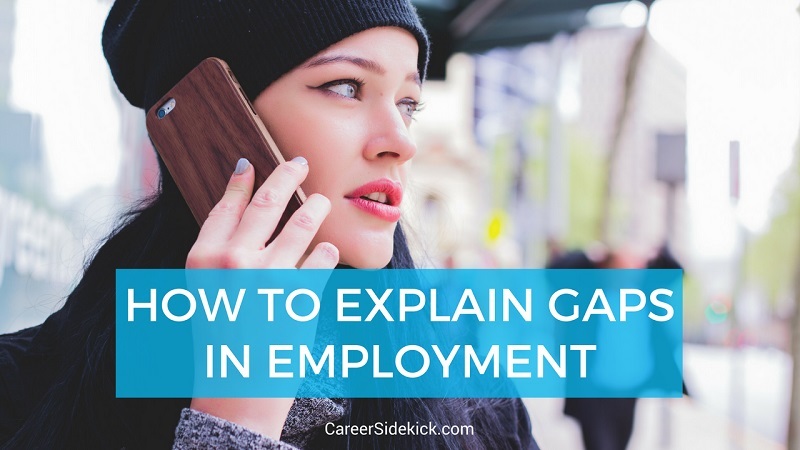 In this article I’m going to show you how to quickly and easily explain employment gaps in your interviews, with word-for-word examples and sample explanations. (I’ll also cover how to explain gaps in employment on your resume and cover letter after that). Explaining gaps in employment is really just about knowing what reasons are okay to share, and which ones you should tell a white lie about or not share. And then being upfront and comfortable with your answer. Taking time off to travel, study, work on a solo project, etc. If you’re explaining a current gap in employment, you need to sound like you’re being selective and that you’re focused on making sure you find the best fit for the long term, rather than just accepting the first job you come across. That’ll make a 6 month gap (or longer) sound a bit better. If you’ve been job hunting during your employment gap, you don’t want it to sound like you haven’t had a single interview in the last few months. That’s never a good idea. If your gap in employment is related to health, travel, a family member’s health, etc…. then it’s fine to say you haven’t had any interviews. Gaps in employment happen, and good hiring managers will realize this. If you’ve made it into the interview, there’s obviously something they liked on your resume. So when it comes to explaining gaps in employment it’s best to be honest and upfront. You probably won’t lose out on the job by explaining the situation. You will definitely lose out on the job by lying or seeming like you’re trying to cover something up. Okay, maybe you’re still writing your resume or having trouble getting interviews. How do you explain gaps in your employment on your resume so you can GET interviews in the first place? List years instead of months for previous positions. (e.g. “2014-2016”). I’ve used this method in the past when I had a couple small gaps between jobs (by small gap, I mean 2-3 months maximum). This won’t work if you have too many gaps though, or gaps longer than one year. If your gaps are longer or more frequent, considering providing a brief note on the resume listing the reason for the gap in employment. Just list it like any other job. Put your previous positions with the dates you held them. And for your gap, you’d have dates there too, and a one-line explanation (“I took a hiatus from work in order to care for an elderly family member in need”). If you use these strategies, consider going onto LinkedIn and making the same changes there too. If these options don’t work for you, write a cover letter! This is a good idea no matter what. In your cover letter, explain what happened in detail and draw their attention to the gap so that you can tell them the full story instead of allowing them to make assumptions (you’re usually better off attacking controversial topics head-on). That’s how I’d explain gaps in employment on a resume. So TEST things out. Send out 10 resumes one way, and if nobody’s responding, change something up. If it’s not working, you can’t just keep doing the same things on auto-pilot. That’s how you end up not finding a job. Companies like that aren’t worth your time. We’re human. Things happen. And there’s more to life than working nonstop for 40 years. So don’t get discouraged if a few companies say they’re not interested, or just don’t respond. I guarantee those are the same companies you do NOT want to work for anyway because they’re going to have horrible vacation policies, bosses who question you every time you take a sick day, etc.